The Royal Malaysian Air Force's first EC725 helicopter is unveiled at the Lima Air Show 2011. The production roll-out of Eurocopter’s no. 1 EC725 helicopter for the Royal Malaysian Air Force was shown today with a live video broadcast from the company’s Marignane, France facility, which was beamed to the Langkawi Maritime & Aerospace Exhibition (LIMA) for an audience that included Malaysian Prime Minister Datuk Seri Najib Tun Razak and Defense Minister Dr. Ahmad Zahid Hamidi. It is the first of 12 EC725s to be acquired by Malaysia for search & rescue and utility missions under terms of a contract signed in 2010. Eurocopter remains on schedule for this important acquisition program, with a total of eight helicopters already in production – and the no. 1 aircraft soon to enter flight testing. The Malaysian EC725 deliveries will begin next year and continue through early 2014. 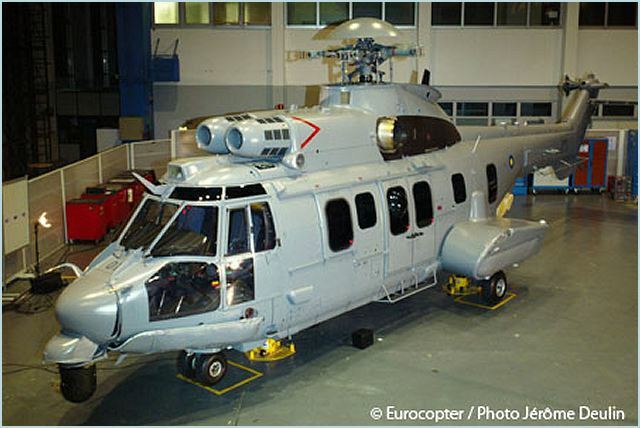 In today’s roll-out broadcast from Eurocopter’s Marignane headquarters and production site, the no. 1 EC725 was presented by the Royal Malaysian Air Force’s on-site project team, led by Col. Tuan Mustafa. As part of the EC725 contract, an agreement for 13 strategic cooperation projects was signed – including the integration of Malaysian industry into Eurocopter’s global supply chain, and the development of joint ventures with local companies to establish an in-country MRO (maintenance, repair and overhaul) facility, a regional EC725/EC225 full-flight simulator center, and other capabilities. The MRO and flight simulator installations are being created together with the Boustead Group, and all 13 cooperative projects will be aligned with Malaysia’s goals of enhancing its industrial capabilities and economic strength through technology transfer and strategic partnerships. To support the deliveries of Malaysia’s new EC725s and enhance Eurocopter’s in-country support and services activities, the company’s Eurocopter Malaysia subsidiary will be moving in July 2012 from its main facility in Subang to a new, expanded site within the Malaysian International Aerospace Center – doubling its capacity.